The bike lanes are being constructed using high-grade pavement tape (meant to least up to a year), green paint and plastic bollards. 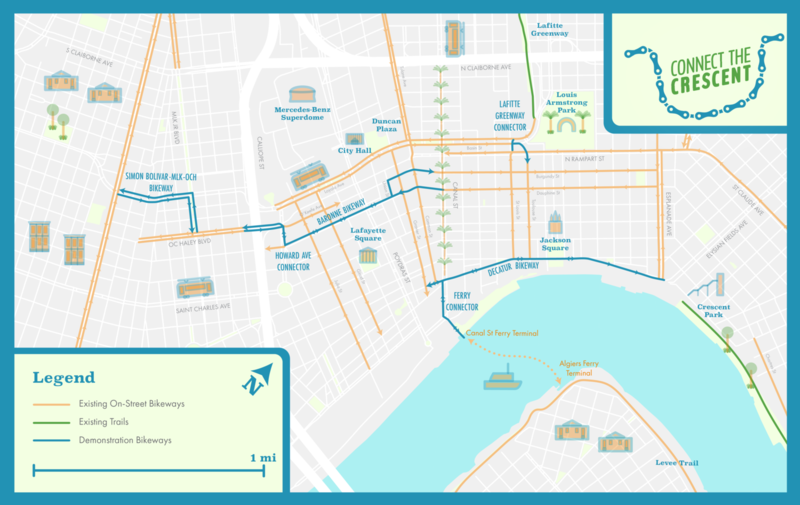 Bike Easy and its volunteers have so far installed a bike lane along Baronne Street downtown and two additional small segments that connect existing bike lanes to the Lafitte Greenway trail to the north and to the Canal Street Ferry Terminal to the south. The other two connections, including Decatur Street through the French Quarter — which will run down the center of the street — will be completed before the end of the month, said Henig Bell. The temporary lanes will be gone by the end of the year, but will hopefully linger in the minds of city officials when they plan their own improvements. “They’ve committed to building miles and miles of protected bike lanes in the next few years,” Henig Bell said. The entire demonstration will cost $75,000.